Would you like to find out which implant would suit you the best? Or the many issues the implantologists consider before deciding which would be the best one? If you would like to be more prepared when it comes to implantation you are at the right place. In order to determine exactly what your current dental situation is, we need you to send us an OPG X-ray. This panoramic x-ray shows whether the jawbone is ready for implantation (whether it has the right structure and thickness). Inflammations,cysts can also be seen and the conditions of the existing teeth can be determined. Why should you send us your OPG x-ray? If you would like to have your missing teeth replaced with dental implants first of all there is a need for an OPG x-ray. This can be done at our partner clinic in London or if you already own one you can send it to us for a personal assessment and a treatment plan. Do you know the reason why there are so many types of implants? the answer is quite simple: some types of implants are not suitable for everyone. The type our implantologists chose depends on the bone structure, the position of the missing areas and on the implantologists’ experience with the use of the implants. The implantologists working with us use the latest methods and materials so you can be sure of the success. Let’s take a close look at the implants. 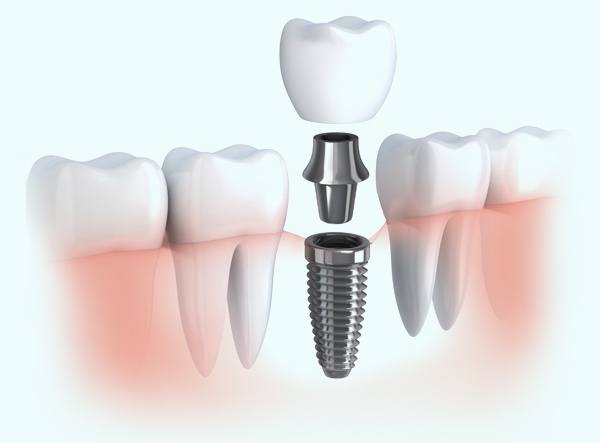 Dental implants act as an artificial root, which having been installed into the jaw bone fuse together with the bone and are then loaded with crowns or a bridge to provide firm, stable teeth. Usually, they are made of unalloyed titanium which is a very strong material and does not cause any allergic reactions (anti-allergenic). Thanks to the expertise of the implantologist, the modern technology and the quality materials the success rate of implantation is high (approx. 98%). How are certain implant types differ? Conventional implants are different from Bi-cortical implants in size, form, their place in the bone and their screw thread form. If your bone structure is suitable for implantation or if you have only a mild bone recession, the implantologist will advise you to receive conventional implants. In the case of a mild bone recession the bone has to be strengthened which will be done by a bone graft or a sinus lift depending on the area that has to be implanted. If the case of a severe bone recession conventional implants are not an option anymore (the bone cannot be strengthened either), the revolutionary Bi-cortical implant types (e.g. BCS/KOS one phase implant) will be the solution. These cases implantation have been refused by the implantologists, however, thanks to this system implantation is available even for those whose only solution was wearing dentures before. You can find out more about the Bi-cortical implants here. Find out more about the conventional implants. As in most cases conventional implantation is possible, we would like to introduce this system to you now. Conventional implants are made up of two important parts: the implant, in other words, the artificial root that is stabilized in the parodontium and the bone and the abutment (the abutment and the crown). Thanks to this form, the implants are very similar to the natural teeth. While chewing the pressure on the crown area gets to the implant through the abutment that ends up in the bone. Thanks to its stability, function and look this is the method of tooth replacement that is the most similar to the natural teeth. One of the most important parts of the implants is the artificial root in other words, the implant itself. As we have already mentioned, they are made of pure, unalloyed titanium so there is no chance for an allergic reaction. If we take a closer look at the implant we can see that it looks like a screw and its surface is rougher. Thanks to its surface the implants already gain a more stable foundation right after the insertion. Thanks to its porous surface the bone tissue covers the implant more quickly which results in quicker stabilization. The abutments is placed on the implant (after a healing period of 3-6 months). As regards its form, it looks like the teeth that are filed down for bridges and crowns. Thanks to the modern technology and materials the dental lab can create crowns that are almost indistinguishable from the natural teeth (in colour, form and surface). Three to six months after inserting the conventional implants a stable connection is born between the implant and the bone (this is called osseointegration in dentistry). If you wish to receive dental implants and have read our blow, we have some good news: you have already taken the first step to gain back the health of your teeth. The implantologists and dental technicians working with us use the latest equipments and materials so you can be sure that every single minute of the treatment will worth it. Please feel free to send us your OPG x-ray and some notes on your dental problems by email (info@tibordental.com), on the phone (+ 44 207 993 4157), or through filling out our contact form.